The Cortina Uplift was named after a mountain village at the foot of the rugged peaks of the Italian Alps. 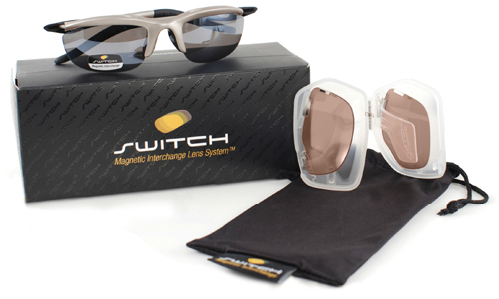 The modern design, deep lens look, aggressive temples and textured colors of these high-performance sport sunglasses mean you'll look great, while the magnetic interchange lenses ensure you'll see right in every light. With an attractive lens and a gentle, rising curve on the bottom, Uplift is the ideal choice for active Rx lens wearers. The Cortina was named after a mountain village at the foot of the rugged peaks of the Italian Alps. Cortina's modern design, deep lens look, aggressive temples and textured colors mean you'll look great, while the magnetic interchange lenses ensure that you'll see right - in every light. Uplift provides a gentle, rising curve on the bottom. The Uplift is an attractive lens and a good choice for Rx lens wearers. There are currently no reviews for Cortina Uplift.